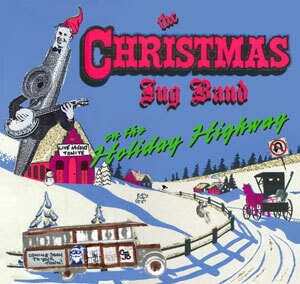 The Christmas Jug Band, a tongue-in-cheek collaboration of some familiar rock and folk legends, continues to set the standard for holiday high spirits. For more than a decade, this self-styled "momentary lapse of sanity grown to ubiquitous proportions" has graced the Freight stage with their raucous revelry and funky, down-in-the-holler "jugbandizations" of seasonal favorites. The CJB's offbeat repertoire runs the seasonal gamut, from "Somebody Stole My Santa Claus Suit" and "I've Got My Love to Keep Me Warm" to "Jingle Bell Rock" and the unforgettable "Santa Lost a Ho." While the band's latest CD, On the Holiday Highway, (Globe), is a hot companion to several previous albums, including their classic Mistletoe Jam, there is no substitute for a live concert! We never know exactly which purveyors of the seasonal jugabilly mystique will enliven the Freight stage this time through, but members include the likes of Austin Delone (Howard Tate, Fabulous Thunderbirds), Paul Rogers (Those Darn Accordions), Tim Eschliman (Rhythmtown-Jive, Etta James), Gregory Leroy Dewey (Mad River, Country Joe), Jim Rothermel (Van Morrison), Blake Richardson, playing washboard, washtub, bells, whistles, accordion, guitar, piano, bass, drums, and assorted reeds and brass, Ken "Snakebite" Jacobs on horns, and Riz Orkestra, a veritable one man band.